Established in the early 1950s Standish Engineering Co Ltd remains a family business and is now run by the second and third generations. Through a policy of continuous investment, over the past 60 years the company has developed a wide range of advanced capabilities and is now regarded as one of the North of England’s premier sub-contract machining facilities. Standish Engineering specialises in the production of one off through to large batch quantities of components that are produced on modern CNC machine tools. The stability provided by continuous family ownership has helped ensure the loyalty of the company’s highly skilled, experienced work force and the continuity of its renowned quality ethos. A comprehensive, in-house manufacturing capability enables a diverse range of work to be undertaken. Customers’ requirements can be satisfied, from initial concepts to final delivery of the competitively priced high quality product. Building on the company’s considerable experience in dealing with the Rail, Construction, Mechanical Handling, General Engineering, Automotive and Food industries, Standish Engineering is now earning a rapidly growing reputation within the demanding UK Oil and Gas industry. Phil Ashcroft, Standish Engineering Quality Manager explained, “Standish Engineering’s quality culture permeates all aspects of the company and encompasses our entire manufacturing activities and all of our admin functions. This can be illustrated by Standish Engineering being one of the first companies in the North West to be recognised with the Quality Award BS 5750 back in October 1987. “Over the past couple of years, our reputation for delivering high quality components to a wide range of industrial sectors has enabled us to break-in to the demanding Oil and Gas industry. Although we use the latest Coordinate Measuring Machine technology for our final inspection checks, the demands of our new customers has meant that we have invested heavily in the best available Oil and Gas industry specific gauges. Complementing its wide range of metrology and testing products, Bowers UK is the agent for the well-known Gagemaker range. Gagemaker develops and manufactures high precision mechanical inspection equipment for the global Oil and Gas industry. The company is a leading provider of Tapered & Straight Thread Measurement Gauges, API Gauges & Products, in addition to ISO and ANSI & ASME Thread Measurement. Phil Ashcroft continued; “We now use Gagemaker thread diameter gauges to inspect internal and external, functional and pitch diameters. Our ingenious new gauges are now delivering higher levels of accuracy than our previously used, more subjective solid plug and ring gauges. A bonus of our new thread diameter gauges is that they eliminate the possibility of accidental damage to threads that can be caused by the use of ring and plug gauges. “Rather than our previously used comparative methods, the use of Gagemaker precision ground thread rolls now delivers precise inspection data. In addition to this, the flexible Gagemaker gauges cover a wide range of diameters, allowing us to make considerable savings on solid plug gauge purchases. This saving has been reflected in our keen pricing and has helped enable us to win several large Oil and Gas related contracts. 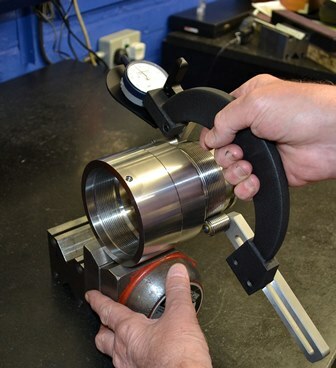 To ensure maximum accuracy, Gagemaker thread diameter gauges use matched sets of precision ground thread rolls that seat securely in the threads under inspection. Gagemaker thread diameter gauges are able to cover a full range of internal and external diameters from 5/8"- 24". The flexible format of the gauges means that users can quickly replace thread rolls or contact points and measure many different thread forms with the same gauge. For more information on the Gagemaker range of products click here.